Muslims all over the globe are celebrating Eid al-fitr since yesterday; from Indonesia, Egypt, UK to China, Pakistan, Bangladesh and India, Eid has been a day of feasts, family bonding and prayers. Marking the end of Islam’s holy month of Ramadan, the three-day festival is celebrated on different days in different parts of the world. In India, celebrations have commenced from yesterday, with streets lit up with happy families and the smells of delicious food tempting us in the monsoon breeze. Be it in the narrow lanes of Byculla in Mumbai or the Charminar in Hyderabad, breaking a fast after a month with a scrumptious feast must be really special! And brands always capitalize on special moments. Popular social networks like Facebook and Twitter began trending with ‘Eid Mubarak’ messages yesterday, and have continued today too. Last year, we saw a range of brands convey their wishes with beautiful Eid Mubarak visuals on Facebook, this year the content is an interesting mix of gifs and videos too. Eid Mubarak greetings all look the same: A crescent of the moon against a starlit sky with the silhouette of the holy mosque forming the background with greetings in Arabic inspired fonts. But, we have been treated to some creative renditions by brands adding their own unique touch. Also, there is the ever handy emotional brand films that can never go wrong. The smartphone brand has cooked up an interesting jigsaw gif bringing together mobile screens to form the final visual. The snacking partner of Indian families found the right occasion on Eid. What a clever crescent moon from the taxi and auto hailing app! The sensational new candy that’s taken the country by storm wants showers of Pulse this Eid. The adorable Zoozoos prepare for the big feast, in their inimitable style. Happiness is when Eid celebrations are on! The glucose biscuit most of us grew up on wishes its community of geniuses. ‘Eat, Pray, Love,’ what else does one need for a happy, prosperous life! The publisher resorted to meaningful life quotes from acclaimed authors for its Eid visuals. The brand always finds a musical connect with every festive occasion. Canon makes its point in this interesting visual. The matrimonial site aptly weaves in love, prosperity and happiness. The real estate portal focuses on brotherhood around the community. The travel brand wishes for happiness to travel to you in this GIF. The skin care brand for men says it with colours. The personal locker from Godrej Security Solutions wants to help you hide your Eidi! Eid calls for a family celebration, check out the bubbling bottle in this cinema-graph. The eccentric duo Ramesh-Suresh are at it again! 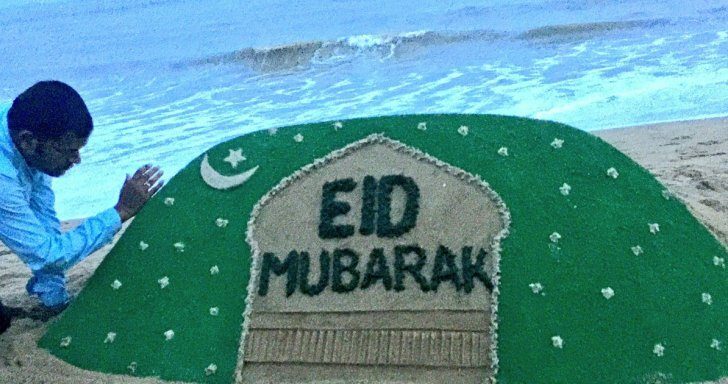 The donut maker has donuts all over its Eid wishes. The skin care brand adds to its care equity this Eid. The retail store opted for a simple illustration with a reference to its ethnic lanterns. Mahindra’s Eid greetings threw light on the XUV 500 as an enabler of new stories in your life. The cookie that spreads smiles turns into the coveted moon of the day…let the feasts begin! The traditional drinks maker has rolled out special flavours for Ramzan: Serbet-e-khaas and Rose tamarind, and a multitude of adorable illustrations of families celebrating Eid. Vistara made a peaceful, glowing gif using brand colours. The airlines always manages to add a brand connect to its season’s greetings visuals, whatever be the day! The online and mobile news site has an appealing Eid visual. The bank has on offer an interesting Eid gift box – the HDFC gift cards as eidi. For your personal kitchen on an app, it’s all about food… let the feasts begin! The electronics retail chain places its wares on the crescent moon! For a dating app, every occasion calls for spreading love! The paint maker chose colours and its brand ambassador SRK for a bright Eid greeting. Yes bank sought to promote its pay app as the easiest way to send over digital eidi to loved ones! The automaker at least managed to embed a brand logo into an otherwise regular visual, but the placement is creative. The auto brand has placed its belief in brand ambassador SRK to take care of Eid greetings, which the King Khan takes on in elan. The ‘M’ of Motorola is an omnipresent form… it exists everywhere! Vivo kept it simple and calming. The healthcare app believes in bringing it all inside a circle of health and happiness, just like its logo. The television channel brought a 360 degree view of the Jama Masjid through Facebook 360 video. The news channel also brought a 360 degree view of the Eid prayers at Jama Masjid through Facebook 360 video. In these troubled times in the world, the home appliances brand chooses to celebrate the spirit of friendship this Eid. This 90-second film featuring two competing clothes shopkeepers is quite amusing in the beginning butcould leave you with a lump in your throat towards the end. The storytelling is just perfect with no brand appearance or force-embed. The hypermarket chain has embarked on a month of ‘doing good’ with its ‘Neki ka Mahina’ campaign in the holy month of Ramzan. The minute-long film features a Muslim doctor addressing an emergency despite it being the time to end her day long fast. After a successful delivery, the family invites her to join them for the meals, which she does with delight. The fact that it is a Sikh family only adds to the beauty of the story, though it is all too common in our country for people of different religions to eat with each other and help each other in times of need. The detergent brand has taken forward its #ReadyForLife campaign, part of its ‘Dirt is Good’ universal theme this Eid, with a heartwarming film. The story is one beautiful act of helpfulness by a child whose clothes gets dirty in the process. Unlike most mothers, this mother does not spank him, instead she gives him an acknowledging nod, amidst a cheering crowd gathered for Eid feasting. Do let us know your favourites in this list. Eid Mubarak to all our readers!